Henry climbed down and, holding his breath, picked up Excalibur. The cave exploded with the sound of trumpets. A heavenly choir began to sing. A surge of power ran up the sword into Henry's hand, and a voice thundered throughout the cavern: "Whosoever Pulleth The Sword From Out The Stone, Is Rightwise Born King of All England." Henry screamed and threw the sword back into the lake. 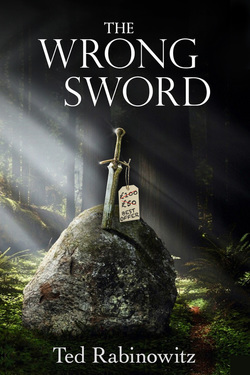 Welcome to the website for The Wrong Sword and its (upcoming) sequels, Hero's Army and The Gates of Alexander. We're here to answer all your Wrong Sword-related questions and, frankly, sell you some books. We got other stuff too! Like, you know, tasty sample pages. And a FAQ. And a blog. And pretty soon we'll have an appearance schedule, little plushy swords for the tots, and NSFW art of a scantily clad Excalibur lounging on a beach. [Or a scantily clad Henry the Rat...we're equal-opportunity opportunists.] Of course, if you want to see something specific up here, let us know.